Non-Staining, Crack Resistent Bumpers made out of 100% Molded Polyurethane. UL Recognized Components. RoHS and WEEE compliant. Rubber Bumpers provide no slip, no scratch protection to prevent abrasions and provide vibration, shock and noise dampening. Self adhesive rubber feet can be used on many surfaces to prevent scratching and to provide a non-slip grip. The thin round bumper is over 1 1/4 inch in diameter which is ideal for cutting board feet or on glass top tables where no slipping is important. Bumper pads are easy to install. Basically, clean, peel and stick. Surface needs to be smooth, non-porous, clean, dry and free of debris, oils and solvents. A mild solvent such as isopropyl alcohol to clean the surface is suggested. Press bumper firmly into place on application surface. Bumper cannot be repositioned without ruining the adhesive. For maximum performance please allow a 24 hour curing time before exposing heavy force or weight. 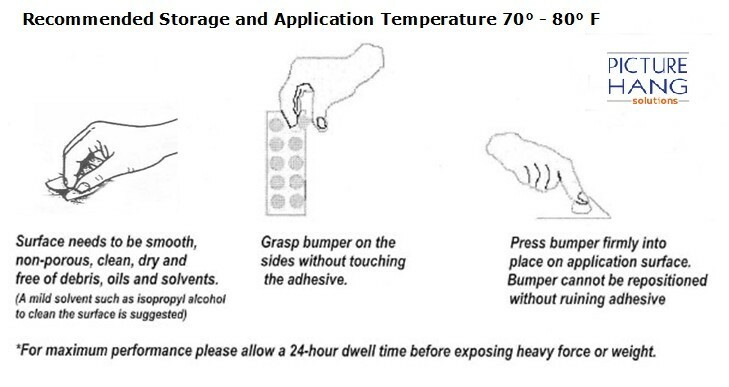 Recommended Storage and Application Temperature is 70 - 80 degrees Fahrenheit.